If you take a peek into our house at any point you will find a collection of junk models and boxes and bits and pieces from the recycling drying as the kids have got creative. It’s one of the easiest materials for me to create with as we always have boxes, egg cartons, bottles, and pots that the kids can use. It doesn’t need a lot of extra equipment and as long as we set up with the wipeable covering for the table then the kids are good to go and get creative. 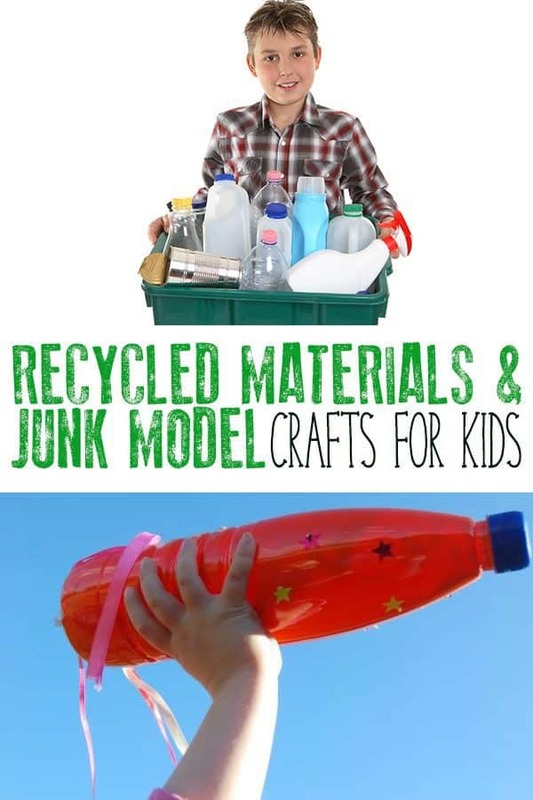 So over time, we have produced a lot of simple recycled crafts and junk modelling here on Rainy Day Mum. These are perfect for crafting year round and fantastic for some Earth Day Crafts and Activities for your toddlers and preschoolers. We have included affiliate links to materials and products we recommend in this article. If you purchase via a link we may earn a small commission. Create your own Discovery Bottles – we love this Ocean Discovery Bottle which is easy to make and then you can wash it out after and reuse it for something else. Use the plastic bottle next time your child asks why plastic bags are bad for the environment. 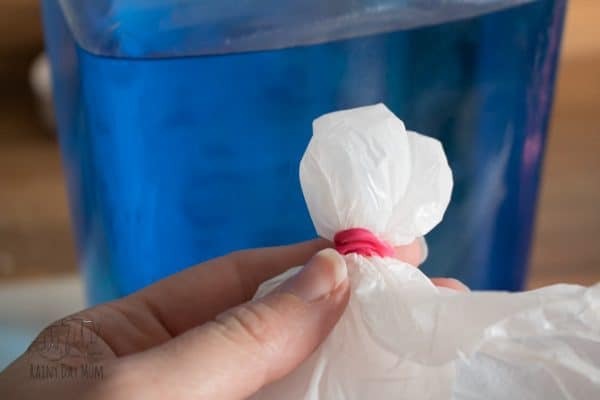 This really simple craft and science experiment is used to show the effect of plastic bags on ocean animals are great for answering one of the many why questions that I am sure your child will come out with at some point. We used plastic bottles to create a windsock – perfect for some pretty decoration in the garden or yard but also great to observe the wind direction and even how fast the wind is blowing. 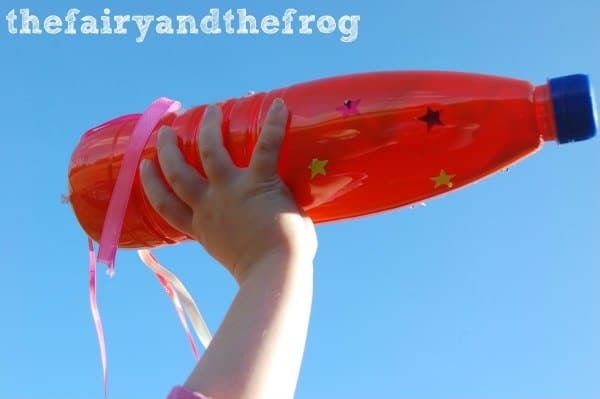 Save your larger bottles and use them to create rockets perfect for some space-themed fun for your toddlers and preschoolers. Save the lids of the bottles and use them to create some bottle top owl pictures. 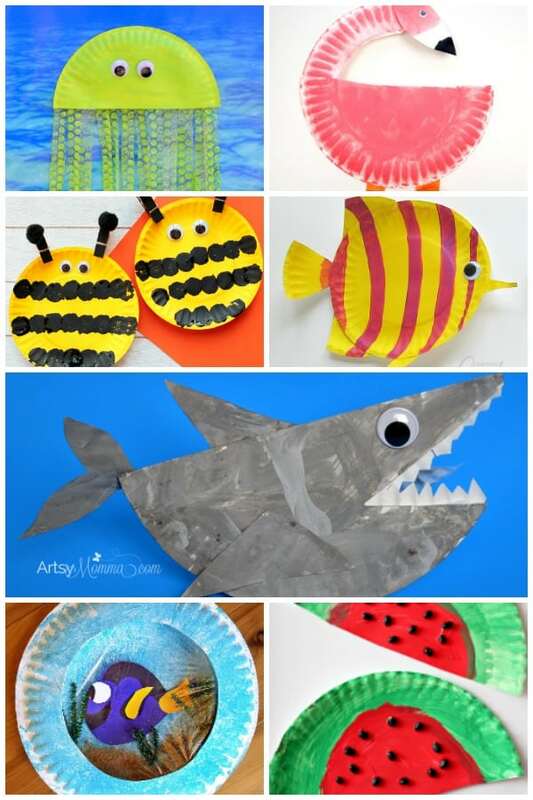 After every party, we always have a lot of Paper Plates so these Summer Themed Paper Plates means that they avoid the recycling and the kids have a good craft supply to use throughout the year. Boxes are great for using in crafts – my kids love them as they come in different sizes and they use them for all sorts of things. We love using shoe boxes and use them for lots of different purposes. 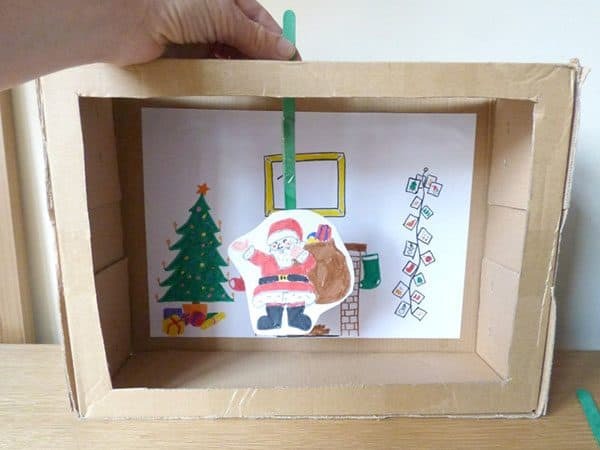 This Puppet Theatre is fun to make and although the puppets that we made were Christmas themed you could use different puppets in it. These 3 Little Pig Puppets from 3 Boys and a Dog would make a great storytelling prop to use with the theatre. We also used the shoe box to create a fabulous box for learning about the constellations. It made it possible for us to create the constellations and then observe them in the winter when there is always cloud cover. A shoe box also makes a great DIY loom for weaving – we started off using it for paper weaving and since then have continued using it to learn to weave with yarn and ribbons. Another great shoe box “craftivity” is using it to make the frame for this fun science experiment to show one of the laws in physic. Combine with some beads and you can make your own Newton’s Cradle. Larger boxes make great resources for crafting this London Bus Cardboard Box was so fun to make with the kids and as we made it we sung along with Wheels on the Bus. One of the first crafts where my two toddlers worked together was to create a Cardboard Box Monster that ate the trash! It was fun and taught them a message as well. We always have cardboard tubes, whether it’s the longer kitchen paper tubes or the smaller toilet paper rolls the supply is endless. They also make really fun crafting supplies with the kids. These Cardboard Tube Crafts are easy to make so that Toddlers and older kids can join in as well. 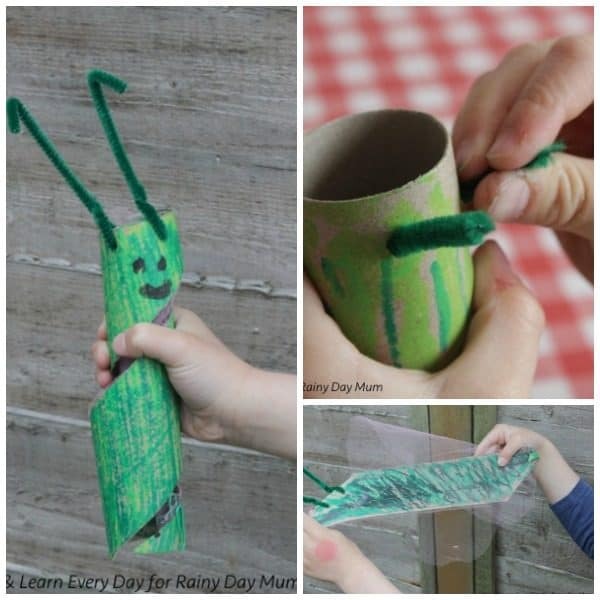 One of my favourite crafts from our Storybook Summer Series back in 2017 was this Cardboard Tube Caterpillar to Butterfly Craft. 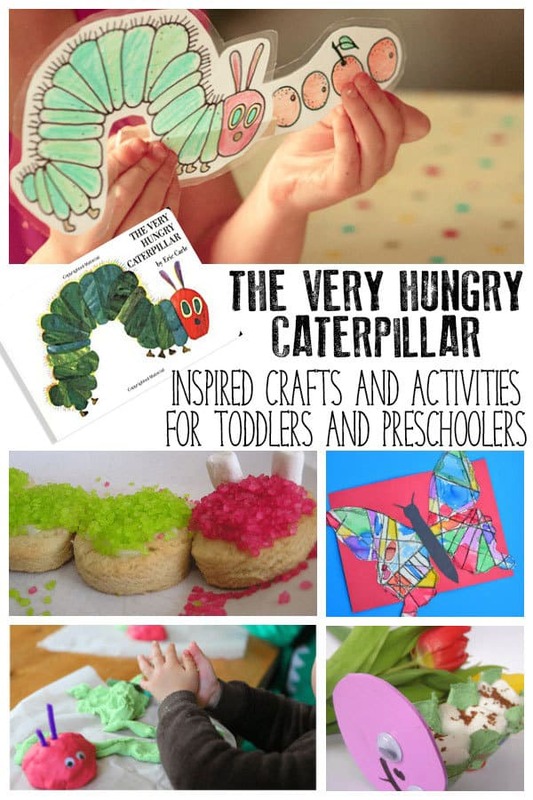 I love the way that it transforms from a fun caterpillar into a beautiful butterfly ideal to make when reading The Very Hungry Caterpillar by Eric Carl. Longer tubes like kitchen paper make ideal basis for creating some pins for bowling games – we have decorated them as snowmen, which turned into a fun number game to learn number bonds to 10 in this Snowmen Bowling Craft and Game. Another of our first projects here on Rainy Day Mum was a toilet paper roll rocket – I still remember it well from back in autumn 2011. 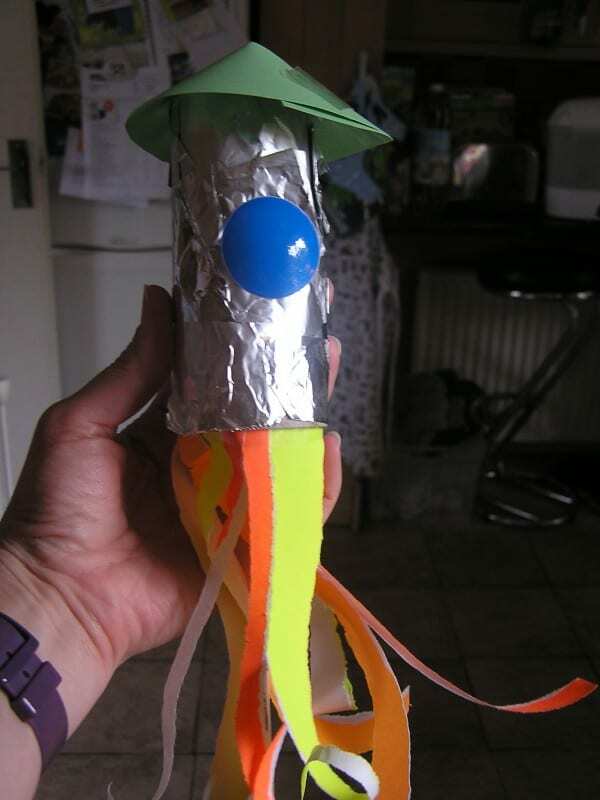 It was one of the crafts that you can make and then do something with which was always a favourite with my eldest. 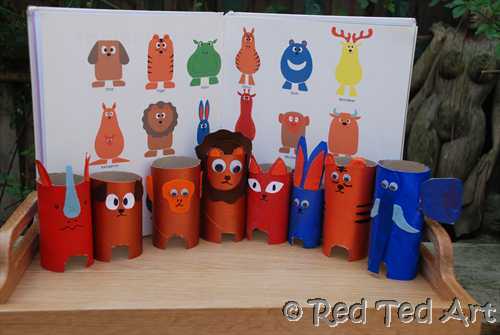 The Fabulous Maggy from Red Ted Art has guest posted here on Rainy Day Mum twice – first with this fantastic set of Zoo Animal Toilet Paper Rolls and then with 7 days worth of cardboard tube crafts perfect to do on Rainy Days with kids. Another favourite material to dig out the recycling box is eggs cartons. It helps that I bake a lot so we always have a box or two laying around. They make an ideal material for creating little characters and over the years we’ve had some fun making them. Egg cartons that come in trays or in rows are ideal for making body parts of animals. 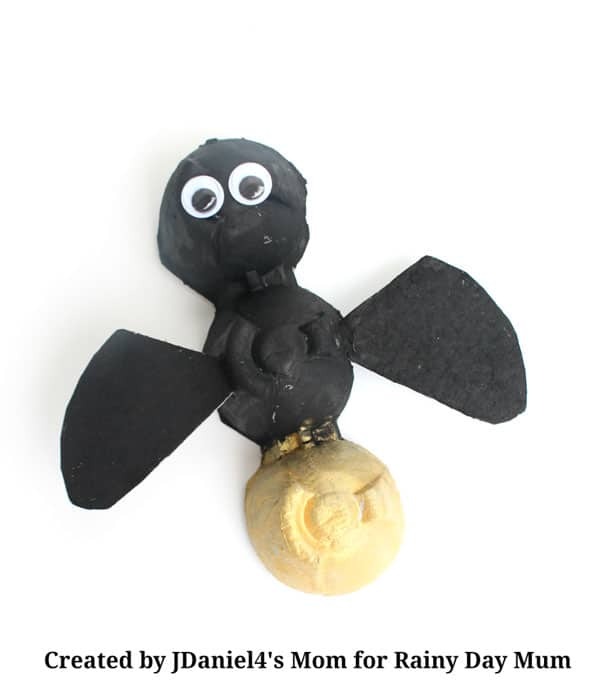 They are the perfect way to create the 3 sections of insect’s bodies and this egg carton firefly is ideal to make with kids. If you want you can spend the time talking about the body parts as you create the firefly. Another fun craft that grows is the cress caterpillar – the egg box makes the perfect place to store the cotton wool used for growing the seeds. They make a great spring craft that toddlers and preschoolers will love making and watching grow. Because you can also make the egg cartons into single critters! They make an ideal way to create some ladybugs and these simple ladybugs are perfect for crafting with toddlers and preschoolers. They are instantly recognisable and your kids will love adding the dots to the bodies. Join 2 egg carton sections together and you have a fantastic little head-shaped animal. 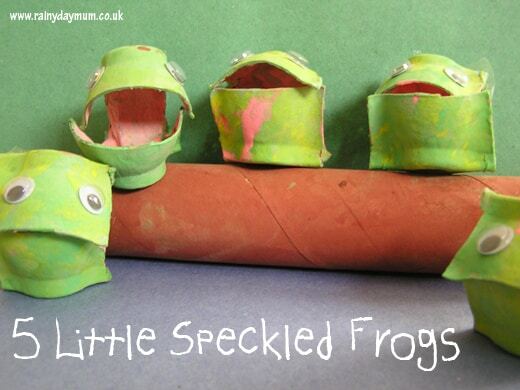 We used them back when I had a frog obsessed toddler to create 5 Little Speckled Frogs from an Egg Box perfect for easy fun crafting with the youngest members of the family. You don’t have to cut up the egg cartons to get creative though we used them to create a simple train and the individual cartons became the perfect “seats” for our little egg head passengers. If I ever have any egg cartons left after the crafting them the kids dig them out and use them as seed starters. Because the majority of egg cartons in the UK are made from paper they make an ideal biodegradable seed container that you can start your seeds off in and then plant out when the weather gets a little warmer. Plastic Cups – this wind chime was great to make with my youngest when she was a toddler. It required help from me so not a craft that you could set up independently, but the joy of working together to create this simple wind chime was a perfect activity to spend quality time together. Dig out a sweater that will be thrown out and create a soft toy with it. 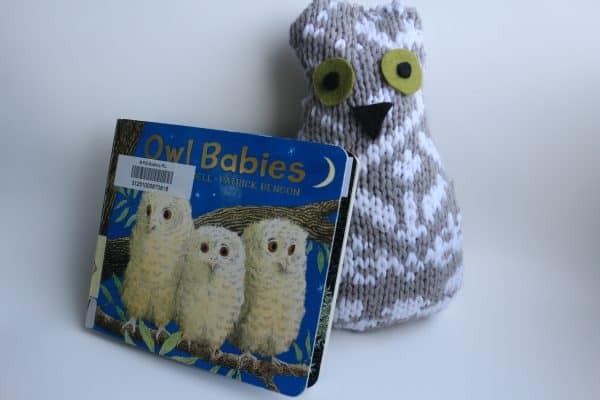 This recycled sweater owl is a perfect early sewing project for kids or a project for you to make with the kids. If you don’t want to get the paints out then paper, scissors, sticky tape and some glue makes a good alternative and is much lower mess. 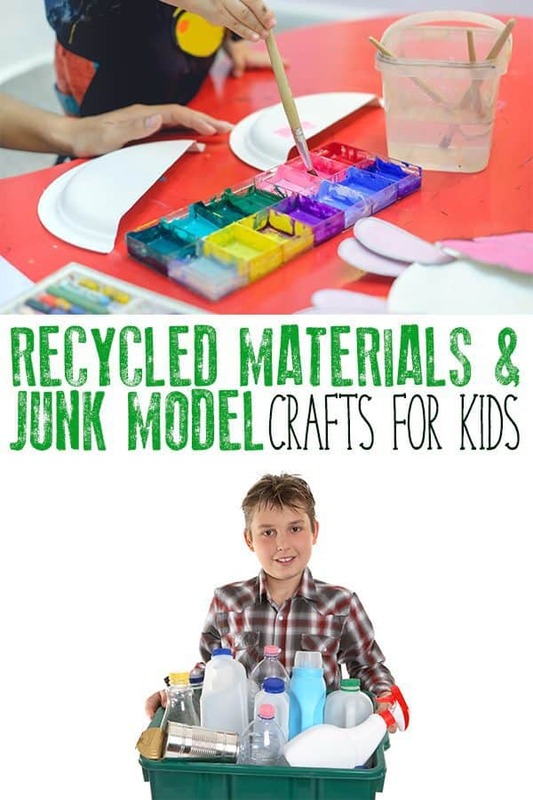 Although there are lots of different sorts of paints you could use with your junk modelling crafts I’ve found that the best one is the ready mixed poster or tempera paints. I buy a set of colours and although I ALWAYS run of our yellow before anything else I use them regularly with the kids. To share it between them I find that it’s great to have paint well pallette and stock up on a mix of different paint brushes as well. 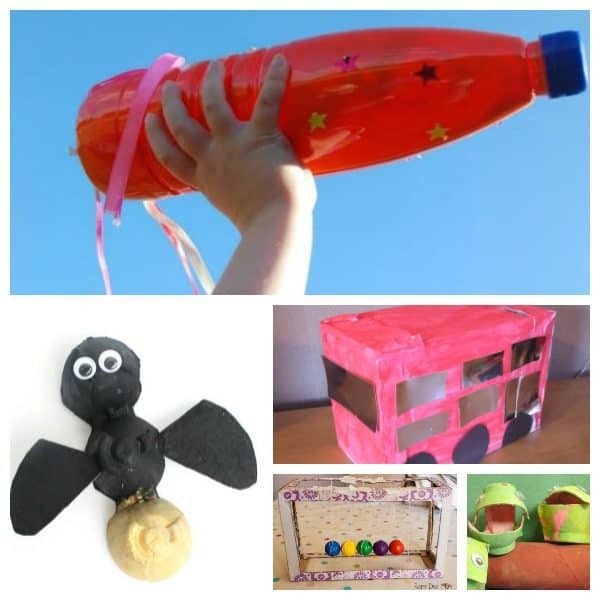 Tissue paper is another of our well used crafting materials – I love the variety of different ways you can use it on the junk models above we tore, scrunched, stuck and glued it in place to add colour to some of the crafts. Pom poms, pipe cleaners and goggly eyes thanks to Mister Maker will forever be essential for crafting in our house. I make sure that these are stocked and stored in jars within my supplies and the kids ask for them. I do it this way because then we don’t have our house goggly eye bombed. I started my craft supplies with a set like the one above and linked here but since have stocked up each of the separately. Find out more about what supplies I use crafting with the kids – because in reality there isn’t much you need for over 90% of the crafts featured here on Rainy Day Mum.